Conformation, Disposition, Breeding, Performance AND Color!! Tobiano and the Black Gene. Our Herd Stallion and most recent "Tru Champion" is Passion Buck, a 1998 Buckskin Tobiano. This young Stallion is a one-of-a-kind....a Buckskin Tobiano HOMOZYGOUS for both Tobiano and the Black Gene!! Add to that Conformation, Quiet Disposition, Athletic Ability and a Champion Pedigree and this Stallion also has EVERYTHING you're looking for!! Buck launched his show career in April of 2002, won his first APHA Reserve World Championship (Junior Heeling) in July 2003 and in September 2003 became our first APHA Champion. Bred to many of our own Mares for 2002 & 2005 Foals, see our Sale Pages for offspring by this extremely talented young Stallion. 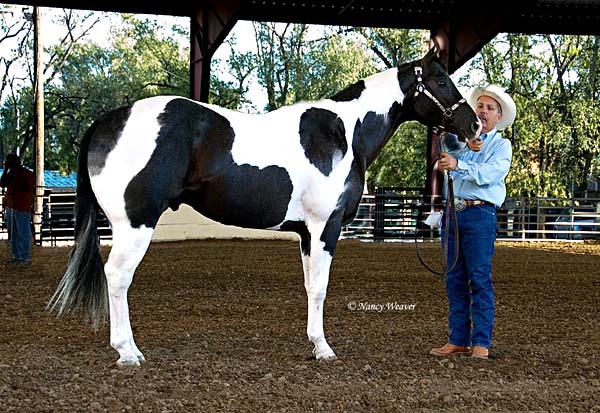 Gay Bar Drummer is a 2000 Dun Stallion that is HOMOZYGOUS for Tobiano. This performance-bred Stallion's Pedigree includes Shots Flying Spark, Gay Bar King, Silver Jingo, Gay Widow, Wimpy II, Skip By Impress, Dixie's War Drum and Three Bars, all on his 4-Generation Papers. He began training in 2003 and launched his show career in 2004, achieving an ROM in Heeling and points in Reining, in limited showing. A Tru Legacy is a 1998 Black Tobiano Stallion that is HOMOZYGOUS for Tobiano and HOMOZYGOUS for Black. Tru Oakley is a 2009 Grullo Tobiano Stallion that is HOMOZYGOUS for Tobiano and HOMOZYGOUS for Black. To compliment our great Stallions we have given special consideration to the selection of the Mares that make up our Broodmare Band. All of our Mares have wonderful dispositions and excellent pedigrees filled with Champions and Performers as we strive to produce Foals that possess good dispositions, plus all the qualities and the potential to perform in the show ring and become the Champions of Tomorrow. Be sure to visit the our Sale Barns to see all the Foals and Yearlings now being offered For Sale. We hope you enjoy our websites! Click here to find out about the latest additions/modifications to our website!